Several months ago, I read and reviewed Noah: Man of Destiny, by Tim Chaffey and K. Marie Adams. Just before Christmas, I was pleasantly surprised that Noah: Man of Resolve was one of the e-books on sale at Answers in Genesis, so I grabbed it. I'm telling you how I obtained my copy so you know that I purchased both books and was not given promotional copies or anything. The publisher and authors probably do not even know that I exist, let alone that I am writing reviews. It has been made clear that this is a trilogy, as seen in part of the name, "The Remnant Trilogy". (See how that works?) I suspicion that all three were written as one large book and then separated into sections. I'm thinking that because the authors don't have continuity errors from book one to book two, which are more likely to happen when authors spend a lot of time off in their writing. Also, books one and two have "a glimpse of" preview of the next book in the volume you'd be holding in your mitts. Plus the fact that the second book takes up precisely where the first one left off, and has some tense action sequences. Noah:Man of Destiny had some editing problems early on, but those were confined to early chapters, and I did not notice any glaring errors in this book. Each of the first two books is slightly under 300 pages, which includes extras after the main novels. More about those extras later. Man of Destiny established characters and conflicts, and there was a bit of romance where Noah met and married the missus. 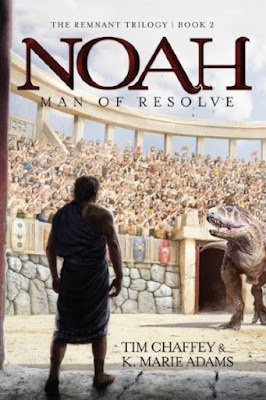 Man of Resolve continues with character development and shows us that Noah was indeed a man of resolve, as were some of his friends. 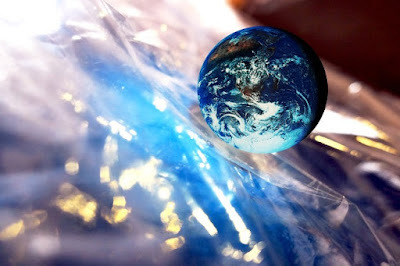 We are given some rather emotional moments of rage, tragic loss, and committed love. Although a work of fiction, the authors were very concerned with staying true to what we know in Scripture, but also using artistic license to tell the story. People are abandoning faith in the Creator and turning to a satanic substitute that wicked people and the "Seer" are promoting. Wickedness is increasing, as we read in Genesis 6:5. There is no profanity, and while sexual immorality is becoming rampant, it is only mentioned. However, there is more violence in this book than the last, and some of it is a bit graphic — may be disturbing to younger and more sensitive readers. The violence is not gratuitous or given excessive detail, and I've seen worse on network television. Let me add that I've read secular books that had violence that was necessary to the storyline that have put me off from continuing. This is nowhere near that intense, you savvy? These books are necessarily full of reasonable creationary speculations about the pre-Flood world's conditions, animals, people, and so on. Again, the authors are careful not to violate what is clearly stated in the Bible. They also explain themselves in the extras: "Behind the Fiction, "Answering Questions Raised by the Novel", "Encounter This", and "Borrowed from the Bible". Here, we see that the authors did a great deal of research and simply did not spin a fun yarn. Even the names of some characters were carefully chosen, and other names were studiously avoided. Working at and researching for the Ark Encounter worked both ways, helping both the exhibits and the novels. Several questions were deliberately raised by the authors to provoke thought in the readers, and to show that some people have unscriptural opinions about Noah, the Ark, and his time. One slightly negative thought is that Noah and his wife seemed a mite underwhelmed when he learned about the Flood and having to build the Ark. Seemed a bit like, "Wow, that's too bad". However, the astonishing news only happened once in history, so how could they deal with it? I'm sure that more about their reactions and feelings will be developed in the third volume. I recommend Noah: Man of Resolve. It is a good story with theological support, faithfulness to the Bible, and gives people things to think about and discuss. Be aware that this second volume is not a "stand alone"; you'd best be reading the first book before getting into this one so it makes more sense. From the "That's the Biz, Sweetheart" department, I have to wait a few more months before commencing to read the final volume, which will be released in about five months.